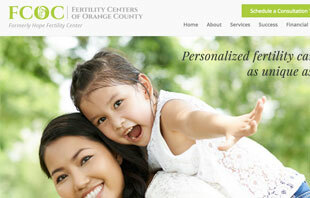 Fertility Centers Of Orange County came to TD Media in need of a website redesign and comprehensive Internet marketing program. The practice had just taken over their facility from another promienent IVF practice and wanted to effectively rebrand while simulatenously preserving the legacy of the previous center in the highly competitive Irvine area. TD Media provided a fresh, modern and highly impactful design suitable for desktop and mobile devices and extended their new identity to essential social media channels like Facebook and Google local. Combined with an efficient Google Adwords campaigns, FCOC started to see results within the first month after launching their new website. TD Media continues to provide ongoing development, marketing and hosting services.